how much storage have I used? I am trying to find out how much storage I have left so on my site, alternatively, how much I have used to date. In order to see how much storage space you have remaining within your site you can view this info in the File Manager. 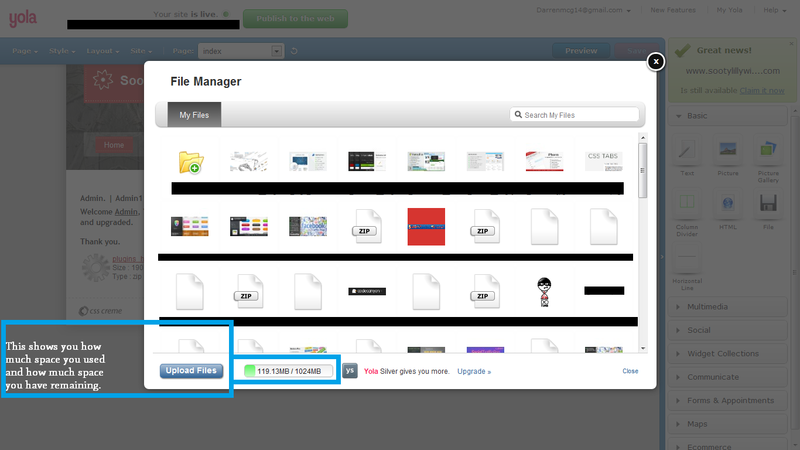 To access the File Manager, click Site > "File Manager". In the lower left hand corner of the File Manager, you will see your Account Status and information about how much of your storage space you are currently utilizing. This information may be useful in determining whether or not you want to upgrade to Yola Silver. Here's a picture to help you locate.